AKBAYAN solon, Representative Etta Rosales urged Filipinos to remember the Commission on Election (COMELEC) tabulators who walked out of PICCbuilding in 1986 in protest of the brazen manipulation of electoral results in favor of Marcos. “We have good reasons to believe that the government will use everything, from public funds to its cheating machinery, to ensure the victory of an unpopular slate. 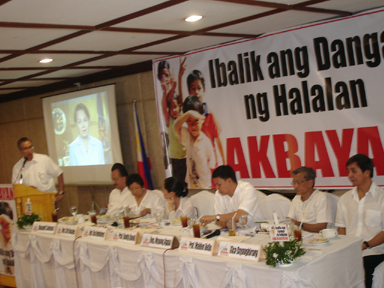 Only the courage of the citizens can counter electoral fraud and protect our democracy,” Rep. Rosales said. Former Davao Rep.Gico Dayanghirang , a member of AKBAYAN’s Executive Committee, called on fellow Mindanaoans to be vigilant and protect the sanctity of the ballot. “The ‘Hello Garci ’ controversy revealed a great disservice to Mindanao . The administration’s cheating machinery will once again try to rob Mindanaoans of their voice this May. We must make sure that cheating won’t happen again in the region,” Dayanghirang said. Meanwhile, University of the Philippines (UP) Professor Walden Bello challenged senatorial candidates to prove their independence from Malacañang . “May 2007 is not politics as usual. Do not allow GMA to spoil the only decent thing that this election could promise – the impeachment of a fraudulent Presidency. The 2007 polls will be and should be used to resolve the crisis of legitimacy,” Bello said. 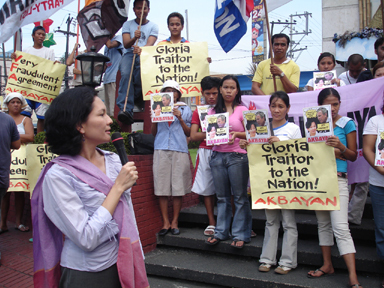 AKBAYAN Rep. Risa Hontiveros , for her part, said that what’s at stake in the elections is the opportunity to reform Philippine politics. “The administration will attempt to cheat, that’s for sure. 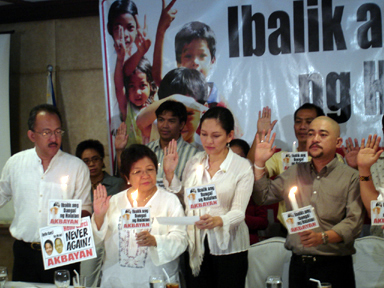 But May 2007 could also be used for transformation, a rebirth of dignity, decency and integrity in Philippine politics. 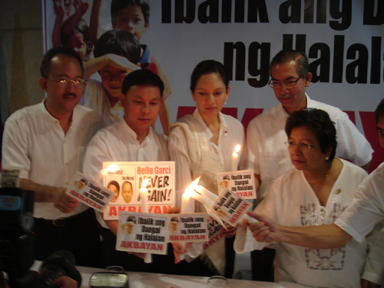 We must cast our votes not only in favor of those who would put a closure to the “Hello Garci ” controversy, but most importantly, those who would choose to put an end to our people’s dehumanizing poverty and political exclusion,” Rep. Hontiveros said.